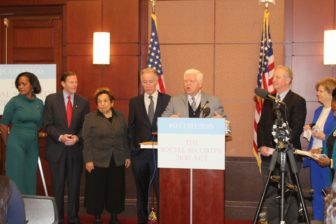 Rep. John Larson announces the Social Security 2100 Act at the U.S. Capitol Wednesday. Washington – Rep. John Larson thinks the third time will be the charm in his effort to expand Social Security benefits and prolong the program’s solvency. Larson re-introduced his Social Security 2100 Act on Wednesday, the third time he’s pitched the bill since 2015. But this time things are different. Because of the Democratic takeover of the U.S. House, Larson is chairman of the Ways and Means subcommittee with jurisdiction over the Social Security program and there appears to be enough support among House Democrats to pass the bill in that chamber. At a press conference in the U.S. Capitol on Wednesday, standing next to a larger-than-life carboard cutout of Franklin Delano Roosevelt on the anniversary of the former president’s 137th birthday, Larson and fellow co-sponsors, Reps. Jahana Hayes, D-5th District, and Connor Lamb, D-Pa., rolled out the bill. Roosevelt signed the bill that established the Social Security program in 1935. With more than 200 Democratic sponsors in the House, the Social Security 2100 Act would increase Social Security benefits for all recipients, providing the biggest boost to those who are now receiving the smallest benefits, and would establish a more generous cost-of-living adjustment. Larson’s bill would also raise the cap on tax-free Social Security benefits, to $50,000 for individuals and $100,000 for married couples. In the Senate, Sens. Richard Blumenthal, D-Conn., and Chris Van Hollen, D-Md., have sponsored a companion bill. But to pay for the more generous benefits, the Social Security 2100 Act contains tax increases, something that poses a political challenge in the Senate, which is controlled by Republicans. Many Republicans have taken a “no new taxes” pledge. Currently, Americans pay Social Security taxes only on the first $132,900 they earn. Larson’s bill would leave income between $132,900 and $400,000 untaxed. But wages that exceed $400,000 would, for the first time, be subject to Social Security taxes. Larson’s plan would also slowly increase – over a 24-year period — the Social Security tax paid jointly by workers and their employer, from the current 6.2 percent to 7.4 percent of a person’s wages. Still, Larson is confident his Social Security overhaul will become law. He often takes a cup of Starbucks coffee to events promoting the bill to stress it would cost most people each week less than the price of that cup of coffee. He also reminds people that, each day, 10,000 baby boomers become eligible for Social Security. On Wednesday, Larson praised President Donald Trump for pushing back against fellow Republicans who describe Social Security as an entitlement that should be trimmed. Like Larson, Trump said it was an insurance policy, paid through Social Security taxes. Larson also said he can envision a partnership between House Speaker Nancy Pelosi, D-Calif., and Trump to promote the Social Security 2100 Act. “It’s not that far-fetched an idea,” he said.